presides at the meetings of the quorum court without a vote but with the power of veto. The county judge coordinates day-to-day intergovernmental relations with municipalities and state and local agencies that become involved with the county on various projects, programs and service delivery. The county judge applies on behalf of all county departments and offices for state and federal grant assistance for which the county is eligible. In addition, the County Judge appoints members to various administrative and advisory boards. The county judge sits in a judicial role as the county court. The county court has jurisdiction in matters relating to county taxes, human and community services, general public utilities, trade and commerce, transportation and natural resources. Barry Hyde has proudly called Pulaski County his home for over 30 years and it is where he and his wife Jeanne raised their three children. Judge Hyde served honorably in the United States Air Force as a member of the Titan Missile Launch Crew from 1974 until 1977. He would later go on to serve as an honorary Commander at the Little Rock Air Force Base and is currently a member of the Camp Robinson/Camp Pike Community Council. In 1987 he started HYDCO, a little construction company that operated out of the corner office of his home. His goal was to create a stable company that was relationship driven, provided the highest quality work and incorporated the latest technology into the business plan. Nearly 30 years later HYDCO has become one the leading commercial contracting and construction companies in the region. 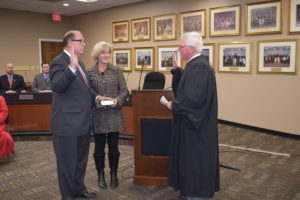 Judge Hyde’s approach to county government is a reflection of his business experience and core principles of stability, accessibility and high quality service. With a strong emphasis on the maintenance and construction of county roads and bridges, water systems and the installation of new tornado warning sirens throughout the county, Judge Hyde puts community health and safety first. He is committed to fostering a sense of community where people feel safe and welcome in order to live, work, open a business and raise their families. He feels this begins by employing and retaining well trained individuals who are prepared, tech savy and accountable. Judge Hyde has raised the bar and expectations of county employees. Judge Hyde has a proven track record as a community leader and dedicated public servant. 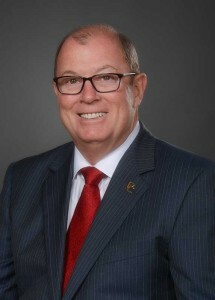 Prior to being elected County Judge, he served the state as a member of the General Assembly for six years, representing District 40 in Pulaski County. As a State Representative, he chaired 5 separate committees, championed fiscal restraint, improving educational opportunities for our children, expanding services for the elderly and promoted positive economic development. Judge Hyde maintains a commercial pilot license and can often be found discovering our state’s natural beauty from the sky in his C-414. When he is not in the pilot’s seat, Judge Hyde enjoys exploring the many miles of trails and roads in our community from the saddle of his bicycle. However, spending time with his wife Jeanne, children Jeremy, Jaime and Carrie and their six grandchildren is the highlight of his day. No matter how busy he may be, Judge Hyde believes that family is the most important aspect of life and is grateful for the time he has to share with them.